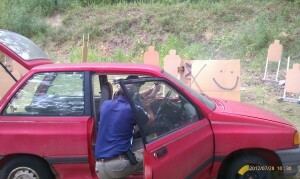 If you’ve spent time training with me, Nate, or Josh you have likely heard us refer to shooting IDPA and USPSA matches. The focus of this post is help illustrate why we believe competitive shooting is useful as part of your defensive training regimen. Additionally I will point out some limitations of defensive-style matches with regards to training. When developing defensive functionality, instructors often balance marksmanship, mechanics, and mindset in their students’ development. This is a simple relationship, but often these simple concepts are over-taught, leading to distraction & confusion by students. While participating in a match, you are not the student, nor the instructor, you are all competitors, trying to perform at your best. Learning that you are not competing against other participants, but competing against yourself if the first step to accepting that shooting matches are ultimately about improving your own skill sets. Marksmanship is developed by learning to engage targets very quickly at common defensive distances (less than 7 yards), while also improving marksmanship skills at distances of 25-30 yards occasionally. Additionally, matches frequently including engaging targets that move, turn, drop, appear, disappear, swing, retreat, or charge the competitor. There are few other opportunities where a person can practice engaging moving targets. The crux of defensive pistol matches is the scoring system, which is based on a combination of time, plus points incurred for poor marksmanship & penalties from failing to follow prescribed actions or for engaging non-threat targets. Herein lies the basis for the true benefit of competition: time-induced-stress. Clearing a true defensive shooting is likely to be a very stressful event for anyone. In traditional marksmanship practice, while shooting bulls-eye targets or plinking pop-cans, there is not an urgency to get the shot off, simply a focus to get the hit, however if you race a friend to see who can knock a pop-can over first, marksmanship typically erodes quickly. This time-induced-stress is at first tough to deal with. It reduces our marksmanship and in some cases, erodes our manipulations too. Add in a few non-threat targets which force the competitor to distinguish between threat targets and innocent by-standers and you have a training scenario that helps develop stronger marksmanship, mechanics, and mindset. Now I refer back to the beginning of this article, where I referenced that defensive pistol matches can be a useful PART of your training regimen. And that is important to remember. First, matches are games. You will not be attacked by a horde of cardboard targets. You will not receive a 5 second penalty for engaging a non-threat (think prison), and you will not get a re-shoot if your equipment fails (think seriously injured/dead). 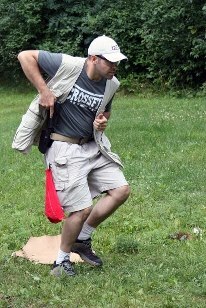 Additionally, some matches do not require the proper use of cover or other commonly accepted tactics – or realize that the best tactic for the challenge that confronts you in real life might be to flee, or draw your pistol and NOT shoot – that won’t work with a defensive competition where you need to be given a scenario where you must shoot in order to have a score. In fact in 100% of defensive matches, when the buzzer goes off you it is understood that you will NEED to fire; whereas in real life, there’s no buzzer and no absolutes. Likewise, as much as we try to level the playing field, many competitors use full-sized guns for matches coupled with holsters selected for competition over carry/concealment, but they choose to carry compact sized pistols for self-defense. It can be difficult to compete when it turns into an equipment race. That brings me once again to the point that if you use defensive matches as part of your personal, defensive training program, you are only competing with yourself, which should take the equipment race out of the equation; it becomes about performing well with the equipment you actually carry. I could certainly continue to enumerate the downside to competitive defensive matches as a form of training, but my point is that they simply need to be PART of the training program. Which needs to include scenarios where you have to decide if you shoot or not, where you have to deal with a sea of non-threats and only 1 or 2 “bad guys”, and where you develop scenarios that are realistic for the environment that you operate in – your home, your work, your life. Finally, here is a link to an excellent article by Phil Strader, Director of Competitions at the U.S. Shooting Academy™ in Oklahoma City, OK.